Once bitten, twice shy? No – we should remain cheerful about dementia research. There are 47 million people living in the world with dementia. Alzheimer’s disease is the most common cause of dementia around the world. It inevitably takes up the ‘lion’s share’ of interest, but it’s important to note that there are many other people living with other types of dementia, for example, frontotemporal dementia, we have to meet the needs of as well. Let me lay my cards on the table. I think it’s possible to create an environment such that people living with various dementias can be at their best, whether in work or not. I feel the emphasis must be on acknowledging dementia as a disability; and, from this, arises a mature conversation about reablement and rehabilitation. But likewise I don’t think we should be subsumed with previous failures in neuropharmacology for us to ‘give up’ on medications which might ‘stabilise’ any underlying disease processes in dementia. I don’t think we should subject them to hyperbole either, but when there are glimpses of hope we should not be in the business of extinguishing hope. I think one of my greatest privileges of all time was a chance to sit next to César Milstein at dinner in Cambridge. The story of monoclonal antibodies is also well known. Monoclonal antibodies were pivotal in medically treating a person who’d contracted Ebola. Monoclonal antibodies are proteins that recognise and fight “aliens”, such as bacteria or viruses. Since the early twentieth century scientists had been keen to produce large amounts of antibodies specific to a particular target for research or clinical purpose, but with no success. 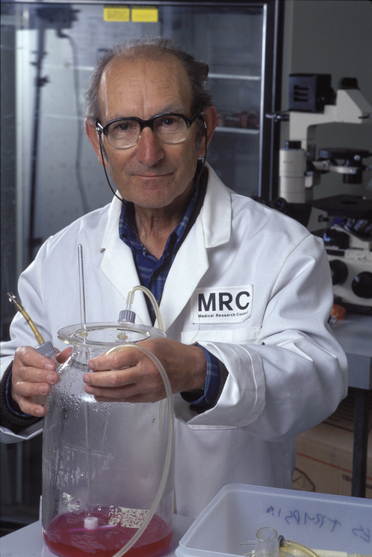 However, in 1975 César Milstein and his colleague Georges Köhler at the MRC Laboratory of Molecular Biology in Cambridge developed a way to produce monoclonal antibodies by fusing myeloma cells — a type of cancerous immune cell — with mouse spleen cells that had been exposed to a target. As well as creating a research tool for investigating the immune system and the pathways of disease, this innovative research also laid the foundations for the production of antibody-based drugs against specific diseases. But this initial success has inevitably caused others to raise their game. First identified by Alois Alzheimer in 1906, Alzheimer’s disease is an irreversible, progressive brain disease that slowly destroys memory and cognitive skills (Alzheimer, 1096). I first became interested in amyloid because of its effects all over the body, but its effects in the brain are extremely noteworthy. Eli Lilly & Co.’s drug solanezumab, and bapineuzumab – a drug developed jointly by Pfizer Inc., Johnson & Johnson and Elan Corp. – had also targeted amyloid plaques. The prediction that “immunotherapies” targeting soluble Aβ oligomers will elicit clinical benefit is supported by studies of human Aβ autoantibodies, of which only a subset appears to be ‘disease-protective’ (in particular, the subset that preferentially recognizes Aβ oligomers) (see papers by Dodel et al., 2011; Moir et al., 2005). Thus, immunotherapeutics with high selectivity for soluble Aβ oligomers, which resemble these protective auto-antibodies, might be expected to deliver a clinical advantage compared with the non-selective immunotherapies in clinical development? One important caveat when considering the activity of Aβ assemblies is the dynamic nature of the aggregation process. Initial studies clearly demonstrated that aggregation of Aβ was essential for toxicity, but characterisation of the assemblies used was limited and it was assumed that, because amyloid fibrils were detectable, it was fibrils that mediated the observed toxicity. Yet, this appeared inconsistent with a finding that there might be actually a relatively weak correlation between the severity of dementia and the density of fibrillar amyloid (Terry et al., 1991). In contrast, robust correlations between the levels of soluble Aβ and the extent of synaptic loss and severity of cognitive impairment have been fairly consistently demonstrated (e.g. Lue et al., 1999; McLean et al., 1999) – the term soluble Aβ refers to all forms of Aβ that remain in aqueous solution following high speed centrifugation of brain extracts. It has been critical, some argue, to re-ignite the interest in finding a pharmacological means of stabilising dementia of the Alzheimer type, in light of recent clinical failures of several high-profile experimental therapeutics for dementia of the Alzheimer type, and the high risks and costs of such development endeavours. The work of Dr Dennis Gillings and colleagues at the World Dementia Council has definitely kept a show on a road. The recent clinical failures also have intensified scrutiny of the ‘amyloid cascade hypothesis’, which spawned many of the recent experimental drugs for dementia of the Alzheimer type, targeting the amyloid-beta (Aβ) peptide. Nevertheless, the causal linkage between Aβ and dementia of the Alzheimer type appears to remain strong and appears to be supported by numerous different studies spanning the past two decades (e.g. Ferreira and Klein, 2011). Let me know turn to BiiB037, which is Aducanumab. I think there is cause to be extremely cheerful about this novel agent, though we need to be cautious: once bitten, twice shy. Aducanumab is a human IgG1 monoclonal antibody derived from a patient with AD by using reverse translational medicine methodology (the background to this is described here in “World Intellectual Property Organization International Publication Number WO 2008/081008 A1”). The overall rationale was that these donors’ immune systems had successfully resisted Alzheimer’s disease and that the operative antibodies could be turned into therapeutics by a process called “reverse translational medicine”: these agents target ‘neb-epitopes’ in the jargon. A Phase 1 safety and pharmacokinetics study began with a single-ascending-dose trial of 0.3 mg/kg to 30 mg/kg intravenous BIIB037 in 56 people with “mild to moderate dementia of the Alzheimer type”. Participants were assessed at 10 time points up to two years after dosing. It seems that, according to the available data, BiiB037 binds soluble Aβ oligomers and fibrillar Aβ with high affinity and binds monomeric Aβ with low affinity. But the next stage of the drug development process inevitably has to turn to safety and efficacy, and I am positive that Biogen will be open in discussing their data with peers in due course. Amyloid-related imaging abnormalities (ARIAs) have been reported in clinical trials of monoclonal antibodies in the dementia of the Alzheimer type. Concerns raised by the US Food and Drug Administration regarding MRI abnormalities observed associated with amyloid-modifying therapy in patients with the dementia of the Alzheimer type prompted the Alzheimer’s Association to convene a work group (Sperling et al., 2011). The work group coined the phrase ARIA (amyloid-related imaging abnormalities) to describe a spectrum of MRI findings that include sulcal effusion and parenchymal edema (ARIA-E) and haemosiderin deposition (ARIA-H). Specifically, ARIA-H refers to areas of hypointensity on gradient echo MRI that are believed to represent deposits of iron in the form of haemosiderin. Animal models currently appear to indicate that anti-amyloid β treatment removes vascular amyloid with a corresponding compromise of the integrity of the vascular wall and leakage of blood resulting in microhaemorrhages and haemosiderin deposition (Zago et al., 2013). The aetiology of ARIA remains unclear but the prevailing data support vascular amyloid as a common pathophysiological mechanism leading to increased vascular permeability. In the phase 2 bapineuzumab trial, dose-related vasogenic oedema (ARIA-E) had been observed (Salloway et al., 2009). Twelve cases of vasogenic oedema were reported, all in treated patients, and all resolved over time. But it seems that ARIA does not seem to be associated with all monoclonal antibodies? As reported elsewhere, PRIME is an ongoing Phase 1b randomised, double-blind, placebo-controlled, multiple-dose study evaluating the safety, tolerability, pharmacokinetics and pharmacodynamics of aducanumab in patients with prodromal or mild AD. “CAMBRIDGE, Mass.–(BUSINESS WIRE)–Today Biogen Idec (NASDAQ:BIIB) announced data from a pre-specified interim analysis of PRIME, the Phase 1b study of aducanumab (BIIB037), in which aducanumab demonstrated an acceptable safety profile and positive results on radiologic and clinical measurements in patients with prodromal or mild Alzheimer’s disease (AD). These data are being presented today at the 12th International Conference on Alzheimer’s and Parkinson’s Diseases and Related Neurological Disorders in Nice, France. The safety observations are particularly interesting. It will be helpful if there is more research into characterising ARIA. All of this makes you wonder whether we are to be cheerful or cautious? I think both, and I keep reminding myself that we have come an extremely long way. Reason to be cautious? Yes. Reason to be cheerful? As long as we don’t neglect the 47 million people living in the world with dementia, yes. Alzheimer A. Über einen eigenartigen schweren Erkrankungsprozeß der Hirnrinde. Neurologisches Zentralblatt. 1906;23:1129–36. Dodel R, Balakrishnan K, Keyvani K, Deuster O, Neff F, Andrei-Selmer L-C, Röskam S, Stüer C, Al-Abed Y, Noelker C, Balzer-Geldsetzer M, Oertel W, Du Y, Bacher M. Naturally occurring autoantibodies against β-amyloid: investigating their role in transgenic animal and in vitro models of Alzheimer’s disease. J Neurosci. 2011;31:5847–5854. Ferreira ST, Klein WL. The Aβ oligomer hypothesis for synapse failure and memory loss in Alzheimer’s disease. Neurobiol Learn Mem. 2011;96:529–543. Lue LF, Kuo YM, Roher AE, Brachova L, Shen Y, Sue L, Beach T, Kurth JH, Rydel RE, Rogers J. Soluble amyloid beta peptide concentration as a predictor of synaptic change in Alzheimer’s disease. Am J Pathol. 1999;155:853–62. McLean CA, Cherny RA, Fraser FW, Fuller SJ, Smith MJ, Beyreuther K, Bush AI, Masters CL. Soluble pool of Abeta amyloid as a determinant of severity of neurodegeneration in Alzheimer’s disease. Ann Neurol. 1999;46:860–6. Moir RD, Tseitlin KA, Soscia S, Hyman BT, Irizarry MC, Tanzi RE. Autoantibodies to redox-modified oligomeric Aβ are attenuated in the plasma of Alzheimer’s disease patients. J Biol Chem. 2005;280:17458–17463. Salloway S, Sperling R, Gilman S, Fox NC, Blennow K, Raskind M, Sabbagh M, Honig LS, Doody R, van Dyck CH, Mulnard R, Barakos J, Gregg KM, Liu E, Lieberburg I, Schenk D, Black R, Grundman M. Bapineuzumab 201 Clinical Trial Investigators. A phase 2 multiple ascending dose trial of bapineuzumab in mild to moderate Alzheimer disease. Neurology. 2009;5:2061–2070. Sperling RA, Jack CR, Black SE, Frosch MP, Greenberg SM, Hyman BT, Scheltens P, Carrillo MC, Thies W, Bednar MM, Black RS, Brashear HR, Grundman M, Siemers ER, Feldman HH, Schindler RJ. Amyloid-related imaging abnormalities in amyloid-modifying therapeutic trials: recommendations from the Alzheimer’s Association Research Roundtable Workgroup. Alzheimers Dement. 2011;5:367–385. Terry RD, Masliah E, Salmon DP, Butters N, DeTeresa R, Hill R, Hansen LA, Katzman R. Physical basis of cognitive alterations in Alzheimer’s disease: synapse loss is the major correlate of cognitive impairment. Ann Neurol. 1991;30:572–80. Zago W, Schroeter S, Guido T, Khan K, Seubert P, Yednock T, Schenk D, Gregg KM, Games D, Bard F, Kinney GG. Vascular alterations in PDAPP mice after anti-Aβ immunotherapy: Implications for amyloid-related imaging abnormalities. Alzheimers Dement. 2013 Oct;9(5 Suppl):S105-15. doi: 10.1016/j.jalz.2012.11.010.